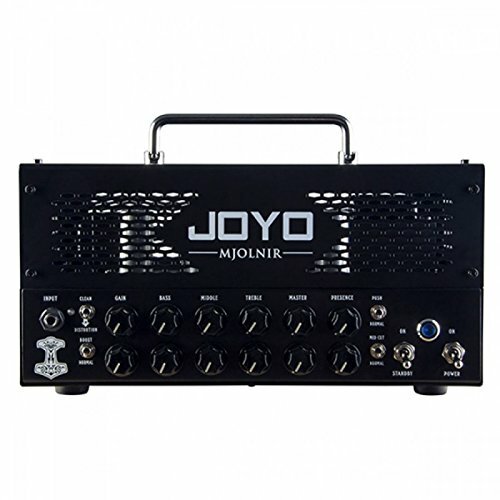 JOYO Mjolnir High Gain Tube Amplifier is designed especially for metal sounds. It features a straightforward approach with deep low end and searing distortion. This amplifier will give twin coil pickups a thunderous roar and make single coils cut straight through the mix! The JMA-15 is designed with a classical high gain circuit and two channels: Channel 1 is CLEAN, PUSH is used for boosting middle frequency and gain. Channel 2 is distortion and includes NORMAL and MID CUT controls. When in NORMAL mode you can obtain fierce modern distortion. Engaging the MID CUT will give you a solid and heavy low frequency. BOOST can be used on both channels. The JMA-15 has 4-8-and16Ω impedance speaker outputs, which can power any mainstream cabinet. An effects LOOP is included, but can be BYPASSED when a pure tube tone is desired. Channel switching is easily accessed during performance via the included FOOT SWITCH.The JMA-15 is housed in an all-metal case, and is powered by three ECC83, one ECC82, two EL84. 15W output, can be used for practicing, rehearsal and performance.